View of “ Jannis Kounellis: Dodecafonia,” 2016. The building that stands at Via dei Vascellari 69 was originally a church (consecrated in the ninth century, deconsecrated in 1942), then a woodworking shop. For the past two years it has been the splendidly run-down site of Gavin Brown’s gallery in Rome. Jannis Kounellis has reacted to this history-laden context, which bears the signs of both religious worship and manual labor, with a show that is dark (literally, as the light is dim), solemn, and so dense with works that it verges on horror vacui. Iron coffers on the floor and walls enclose old pieces of furniture or fabric wrappings that, in turn, enclose other pieces of furniture. What come to mind are sarcophagi. In fact, hidden within many of the works is an overcoat, a metonym for an absent body. At the end of this mausoleum of sorts, where the church altar would have been located, stands a monumental ladder with iron rungs; a heap of coal lies at the foot of the ladder. Is it a longing for transcendence? Or a proud claim of laicism, with the coal and the ladder—symbols of matter and human work—replacing the cross? The show’s title, “Dodecafonia,” does not respond directly to this question. Rather, it invites associations with the epic deeds of the early twentieth-century avant-garde, with its goals of artistic and political renewal, to which Kounellis never ceases to refer. Regarding his choice of title, the artist has also emphasized the importance of the literal significance of the Greek word phone (voice) contained in dodecaphony. 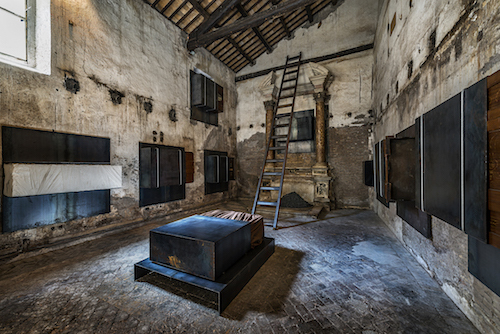 Kounellis initially planned to exhibit twelve works—the title thus signifying twelve voices, in line with dodecaphony’s meaning—presenting the show as a sort of tragic chorus. The number of works changed as the show developed, but the title, fortified by its original references, remained.